On January 1, 1994, in the impoverished state of Chiapas in southern Mexico, the Zapatista rebellion shot into the international spotlight. In this fully revised third edition of their classic study of the rebellion’s roots, George Collier and Elizabeth Lowery Quaratiello paint a vivid picture of the historical struggle for land faced by the Maya Indians, who are among Mexico’s poorest people. 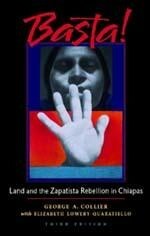 Examining the roles played by Catholic and Protestant clergy, revolutionary and peasant movements, the oil boom and the debt crisis, NAFTA and the free trade era, and finally the growing global justice movement, the authors provide a rich context for understanding the uprising and the subsequent history of the Zapatistas and rural Chiapas, up to the present day. ¡Hoy decimos basta! Today we say, enough! Download the Foreword by Peter Rosset. Download the Preface to the Third Edition.